My friend Susie (Hilber) Piacenza is a PhD student at Oregon State University and has been here in Honolulu for two weeks working on a green sea turtle population model. It’s been great to have Susie here to hang out with after work, but its also been really neat learning about her research. I asked her if she’d write a guess blog to share with all of you, too. She agreed, and so here’s the skinny on my turtle modeler friend’s research. We don’t have a good way to count all the individuals in a population, because sea turtles are famously “peripatetic,” meaning they embark on far ranging migrations in search of juvenile developmental habitats, foraging grounds (for green turtles: lush, abundant sea grass beds), mating and nesting grounds. Biologists usually only encounter sea turtles in three ways: juveniles in their developmental habitat; females on nesting beaches; and when they strand. There’s a lot we’re missing. So, how can we really know how many endangered green sea turtles there are, and if the population size is growing or declining? To answer this question, biologists can count female nesters or number of nests on nesting beaches. My job is to take those nesting numbers and predict the entire population size, now, and into the future, and under various scenarios. Thanks to conservation and nest protection efforts, several populations of green sea turtles worldwide have shown encouraging nesting trends within the last decade or so. I’m studying two of these populations: Hawaii and Florida. 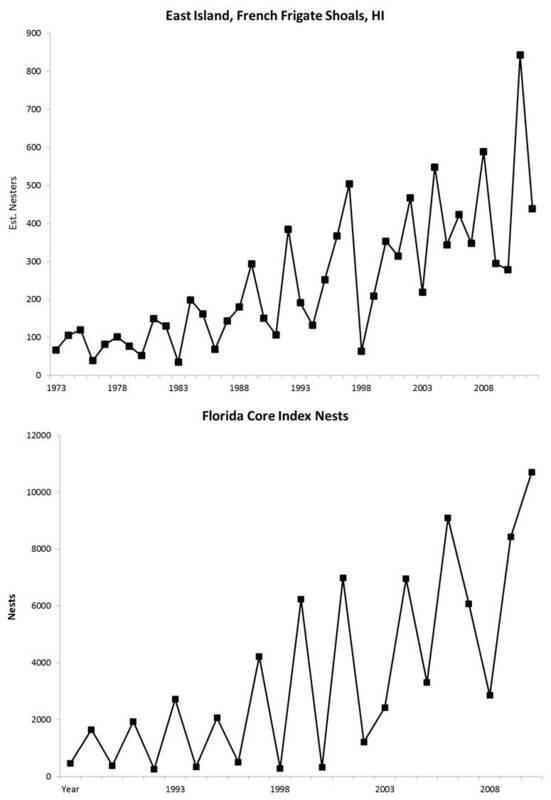 These graphs show the trends for East Island, French Frigate Shoals in the Northwestern Hawaiian Islands where the majority of green sea turtles nest (top panel), and for the State of Florida (bottom panel). 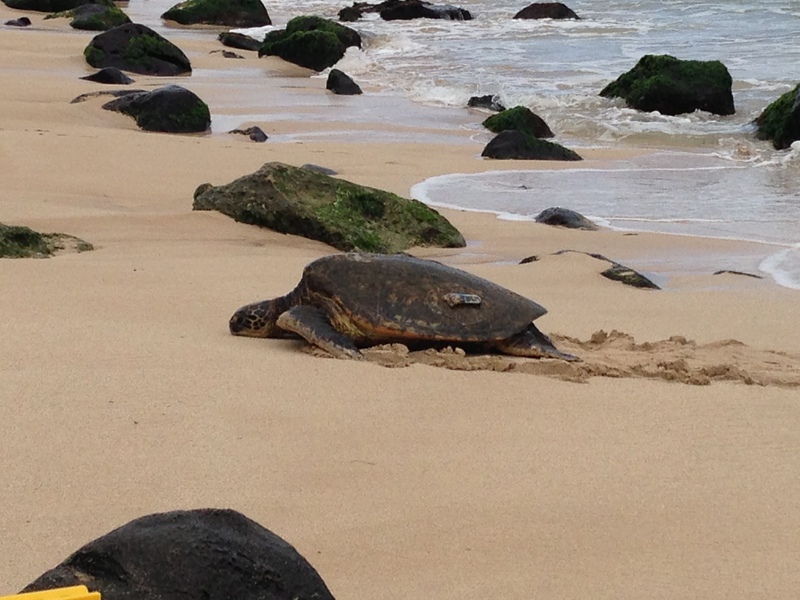 Encouraging nesting trends for green sea turtles in Hawaii and Florida. Keep in mind that these numbers aren’t directly comparable since there are differences in the count methods (in Hawaii count the number of females nesting each year; and in Florida where there’s a lot more ground to cover (1,197 miles of coastline, to be exact), biologists count number of turtle nests each year). Also, females don’t nest every year, and some years are better for nesting (maybe the water is warmer and the ocean is more productive) and some years are poor, hence the cyclic up-down trend in both graphs. What do I do with those numbers? Well, I’m studying technical tools that can establish population recovery, linking life history traits (e.g., the age at which individuals begin to reproduce) to indicators of population recovery. I’ll use long-term sea turtle monitoring data to build population models and computer simulations to test for accuracy. Finally, I’ll use a technique called Management Strategy Evaluation, to test how conservation actions influence population trends and make prospective guidance about future conservation. However, talking about a species being “recovered” is kind of tricky. What does recovery really mean? How many turtles do you need to be recovered? What’s the target population size and how do we justify it? How many turtles did there used to be? How far back are we hoping to recover to? Can we ever realistically expect turtle populations to rebound to historic levels now that humans have modified the seascape? What will happen to sea turtles with climate change? There are a lot of important questions, and my research begins to chip away at the tip of the iceberg. Conservation biologists and resource managers are required to consider all of these things, and more, on a regular basis, so hopefully my research will be useful to them. What am I doing in Hawaii? This month, I was on Oahu for two weeks to work with my collaborators at the National Marine Fisheries Service, Pacific Islands Fisheries Science Center’s Marine Turtle Research Program (MTRP). To build a Hawaiian green sea turtle population model, I’m using data that the MTRP has collected over the past 40+ years. Before using exisiting data, its good practice to learn as much as you can about the data collection and archive methods. I want to highlight that this is an invaluable dataset because of its long time series — dating back to the early 1970s! This is almost unheard of in turtle biology. So, I had a lot to learn in just two weeks. Get out from behind the computer! 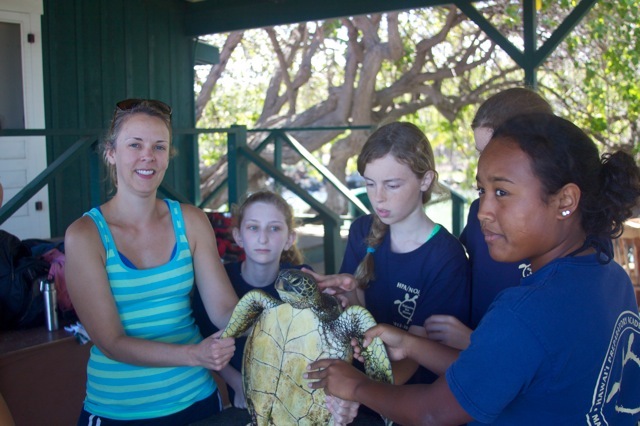 OSU PhD student Susie Pacenza assists with in-water green sea turtle monitoring on the Kona coast of Hawaii. While Lindsey is spending quality indoor time in a stable isotope lab in the lovely Manoa Valley, I’ve had several opportunities to leave my laptop, spreadsheets, and R-code and get outside. I assisted on the necropsy of several green and olive ridley sea turtles. Performing necropsies is important because it helps us to understand the different causes of mortality, as well as allowing us to opportunistically collect other types of data, like DNA and toxins (from exposure to pollutants in the ocean). Stranded turtles also often make up those age classes we typically don’t see otherwise (adult males, offshore juveniles, etc.). Other outdoor highlights of my stay were when I helped to release a stranded green turtle entangled in a fishing net that also had a fish hook lodged in its mouth (which one of the staff was able to remove – woohoo! ), and assisting with in-water monitoring on the west coast of the Big Island on March 13th. HiwaHiwa is an adult female green sea turtle that frequently basks on the beach in Laniakea. One unique aspect of Hawaiian green sea turtles is that they bask, which means they rest on the beach in broad daylight. Sea turtles are cold-blooded; resting mid-day in the tropics would normally mean they would be at risk of over-heating. No one knows for certain why green sea turtles do this, but there must be some advantage. Perhaps the water in the middle of the Pacific is a little too cold for their liking? Since the Hawaiian Islands are in the middle of the Pacific, there’s not much of a shallow nearshore zone for the water here to warm up, like around a continent. Regardless, it’s a wonderful opportunity to observe wild sea turtles of both sexes. I went to Laniakea beach on the North Shore of Oahu to view them and it really is a sight to see. One turtle, “HiwaHiwa,” which means “precious; beloved; esteemed; favorite,” crawled up while I was there and she had a time-depth recorder (TDR) on her back, and she’s been documented diving to 570 ft deep. What does a green sea turtle do that deep? Not feeding — she eats algae and seagrass, which can’t grow in dark waters that deep. The volunteers at Halama Na Honu (Hawaiian for “help the green sea turtles”) know her by sight and she frequently comes to bask. In fact, the volunteers recognize most the turtles that bask at Laniakea. Although my time in Hawaii is done for now, this summer I’ll be traveling to Florida where I’m hoping to assist with nesting beach monitoring with our collaborators at the University of Central Florida and Southeast Fisheries Science Center. As a “turtle modeler,” I don’t have my own field or lab work to conduct, so I am able to take the time to visit and help with awesome field projects, learn about the different kinds of research methods employed, and meet a lot of other really cool and interesting biologists. Sea turtles are globally distributed, which means that collaboration is essentially mandatory. There are a lot of aspects of working with sea turtles I love and this is definitely one of them.